When I was studying abroad in Paris, my mom visited me for a fun week of shopping, touring, and eating (and Disneyland Paris, which I’ll talk about in an upcoming post!). We wanted to try a unique tour experience, so we looked in to different options and one really caught our eye: Bustronome, an upscale bus tour that offered a gourmet 6 course meal served while riding through some of the most iconic sites in Paris. While this experience is pricey (dinner is 100 euros per person or 130 including wine), it was one of the highlights of our trip. (If you want to try this but don’t want to shell out $100+, you could take the shorter lunch tour!) You depart from the Arc de Trimophe and ride across the heart of the city before ending your tour (and your dinner) in front of the Eiffel Tower just minutes before it sparkles on the hour. The panoramic windows offer wonderful views of the Opera Garnier, Notre Dame, and Les Invalides. Here’s a map of their current routes (the dotted line is for lunch, and the white line is the dinner route). The food and wine were delicious. The menu changes every season, but for reference, here is the fall menu from this past year. The food, while fantastic, may be a bit too adventurous for picky eaters, so reference their site ahead of time to see if the menu suits your tastes. The presentation of the food was beautiful, and you could tell the chefs really tried to incorporate local, seasonal ingredients in the dishes so you could get a great taste of Parisian cuisine. And don’t worry, the tables are especially set to make sure your food doesn’t go flying every time the bus makes a turn ! 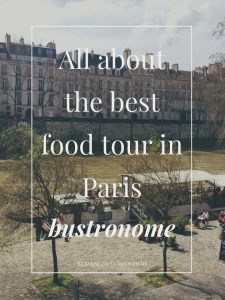 The Bustronome dinner tour is one of my favorite memories from my time in Paris, and I recommend checking it out if it’s within your budget! (Note: because the seating is on the second floor of the bus and you have to go up a small flight of stairs, this is not an accessible attraction). It’s an amazing way to see the city while enjoying wonderful Parisian food and wine.